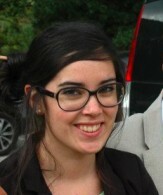 Elise Marsan is a PhD student in the team Genetics and physiopathology of epilepsies, at the ICM. She received an undergraduate degree in Cell biology and physiology at Toulouse III University (2010) and graduated in Integrative biology and physiology with a specialty in neurosciences at Sorbonne’s Paris VI University (2012). During her master degree, she studied at the Lund University in Sweden, thanks to the European exchange program ERASMUS. Elise Marsan is also an active member of the ICM young personnel association (Les Ajités). In 2016, she won the ICM Brain Booster Challenge to finance a one year innovative and interdisciplinary research project built by young scientists. Elise Marsan’s PhD project is about familial focal epilepsies with mutations in DEPDC5. Patients carrying mutations in DEPDC5 present epilepsy associated with cortical malformations, and are mostly resistant to treatment. Both human and animal model studies aim to better understand the mechanisms leading to this epilepsy. Special attention is given to the mTOR pathway, a main cellular pathway known to be affected in these patients.